Conflicts, cliques, and differences cause friction, avoidance, and frustrations. They end up leaving both sides drained of energy and impede desired results and success. How can the Extended DISC Work Pair Assessment provide the necessary information about ourselves and others to develop better interactions and become more successful together? We may mistake the action of others as their intentions. For example, one person may be intent on getting the task done, to the point he or she forgets to get input from the other. The other views the same action, not as getting the task done, but as insensitive and not a team player. We may fall into our autopilot mode when we work with each other. The DISC tool focuses on behaviors; not your experience, skills, values, etc. It identifies our most comfortable behavioral style so we can understand how we prefer to operate, make decisions, communicate, etc. It allows us to understand each others differences with less misunderstanding. We are who we are – there's no need to change who we are, but we can control how we interact with others. We chose whether to modify or not modify our behaviors. What we can’t control, as much as we'd like to sometimes, is the behaviors of others. DISC is powerful, even beyond self-discovery. It helps us understand how people are different and how we can make behavioral adjustments resulting in more successful interactions. Once we recognize our similarities and differences, we can make better adjustments in our interactions. 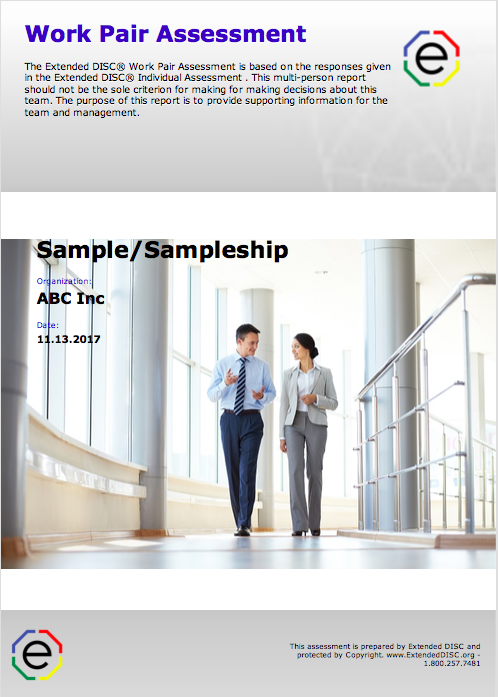 The Work Pair Assessment combines two DISC profile results into one report. It identifies the dynamics, strengths, and development areas of the two individuals. The results present concrete information in the context of who you are and who your work pair member is. It is non-judgmental. There's no better or worse or good or bad styles; just different ones. The tool provides a well-defined setting for understanding one another. This hopefully allows both sides to be more open to the results because it’s unbiased. The purpose of the Work Pair Assessment is to provide unbiased information on how each other prefers to do things - our patterns of behaviors. How do we come across to others? We can then further our appreciation of each other's similarities and differences by making decisions on how to modify our behaviors more effectively. The Work Pair Assessment is designed for both individuals to be involved in the process. Consider the report as a "work in progress". The report questions are designed to help start a conversation and give us a clearer picture of who we are as individuals; instead of forming our own view - because those perceptions are based on our values and may not always be correct. The profiles are a good place to start. Review and compare your DISC styles. Are your DISC styles similar or different? Take some time to talk about the attributes of each of your styles. While you’re focused on each of your dominant styles, make sure you also discuss the traits of the others styles you most see in yourselves. Keep in mind, we are not just our dominant style; 99% of us are a combination of styles. 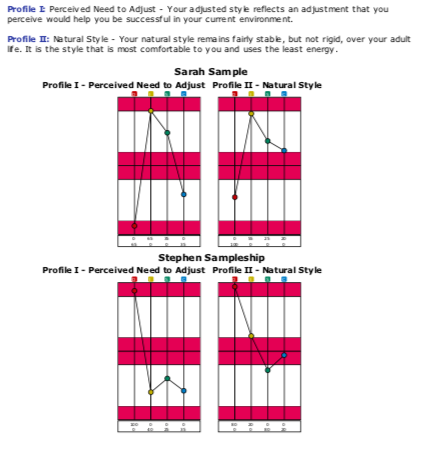 In the example, Sarah Sample's natural style is a dominant I-style whereas, Stephen's is a dominant D-style. Sarah is likely to be more people-focused, social, optimistic, and talkative; but she can also be flighty and disorganized. Stephen prefers to be in charge, is results-focused, direct, and individualistic; but he can also be demanding and impatient. They are both individualistic and prefer to work in fast paced environments. In addition, Sarah's least comfortable style is D-style, which is Stephen's most comfortable style. The disparity is likely to cause misunderstanding and conflict. We enjoy using our strengths, but we often get into trouble from overusing them. Consider the strengths that you bring to your work pair. Have there been times you’ve overused your strengths? For example, one of Sarah’s strengths is “knows how to make things sound positive.” She's great at giving positive feedback and selling ideas, but what happens when she's focused only on the positives? She may come across as overselling, trying too hard, or disingenuous. This is an example of Sarah overusing her strength. We can amplify each other's strengths when we share similar strengths. If we both are risk takers, we could be making more mistakes from those risks when we are working together. The Work Pair Assessment provides us a common language to talk about our communication styles. How do we both prefer to give and receive information? Our communication styles come across differently to different people, and understanding that will help you make the adjustments needed to have better interactions. For instance, if you’re a D, talking to an I, you probably get right to the point and can come across as too demanding and unyielding. If you’re an I talking to a D, you can come across as chatty or not focused on results. The Behavioral Competences shows how our natural behavioral tendencies align. The numbers indicate energy levels, NOT your ability to perform the behavior. The higher the number, the ones to the right of the middle, the more comfortable each person is with the behavior. The lower the number, the ones to the left of the middle, the more energy and concentration is needed for this behavior. The more natural the behavior is, those farther to the right side of the graph, means the behavior takes very little energy. If the behavior is on the left side, it means that type of behavior is not very natural for the person and requires more energy. In this example, you can see that both of these individuals prefer to talk instead of listen. However, one is much more comfortable making tough decisions while the other will need to concentrate more when making tough decisions. Look at the places where you’re BOTH on the right side; those behaviors come more naturally to both of you. Remember to pay close attention because the two of you may overlook or skip these areas; you don't have to think about these behaviors. Areas where you are different, gaps between your positions on the bar graph, indicate different underlying opinions and values. These differences are likely to cause different preferences. Talk about these. Look at where both of your DISC styles fall more to the left side of the bar graph; those NOT natural to your style. Since these items require more energy from each of you, talk about how you can address that, and how you can watch out for it. It’s important to identify priority areas and create a plan of action for addressing ones that have the potential to create challenges. Going through the Work Pair Assessment together is critical to the process. We don’t want to just give someone a copy and tell them to read it. It is a way to get to know each other better; to get a clearer picture of the other person. As managers, you can make sure your employee knows that this is their opportunity to get to know you and learn what makes you tick. 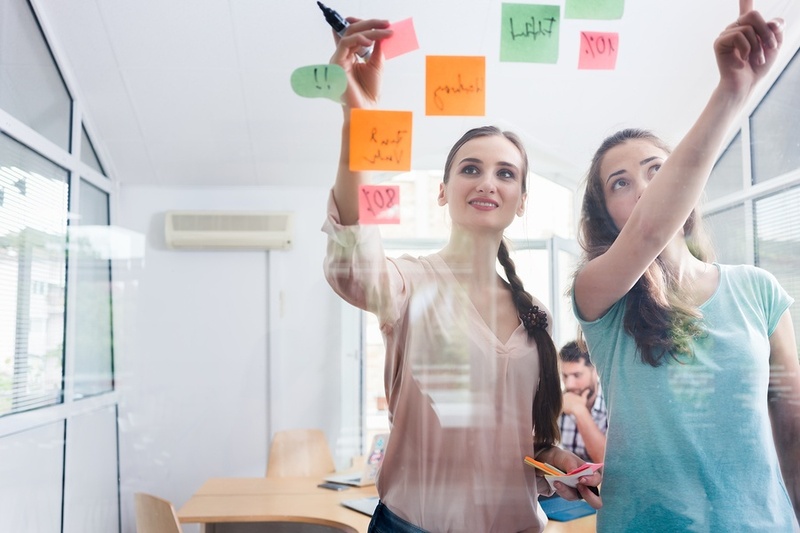 It speaks for you as a manager that you yourself are willing to be present and show who you are – it helps to instill trust and prevent future miscommunications from happening. A great place to start is early in the onboarding process. Remember, the tool is about our self-awareness and our awareness of others. It’s an opportunity to gain a better understanding of each other. We learn to appreciate the differences and uniqueness each of us bring to the table. 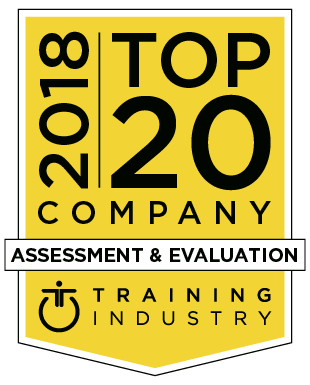 The Work Pair Assessment is designed to put our behavioral preferences into context. We can better understand who the other person is, how they differ, and how to adjust effectively and build better connections.